Lambda Chi aLpha page 2 W hen Michael "Brandon" Johnson, ΓΡ 1903 was first introduced to Gamma-Rho Zeta by his best friend, Timothy "Luke" Abel, ΓΡ 1827, he im- mediately felt a connection to the brotherhood. "Once I met members from all different pledge classes during recruitment, I knew I had met a group of like-minded men that would become a valuable part of my life." Throughout his undergraduate career at the University of Oklahoma, Brandon was constantly supported by his brothers to achieve his goals. Whether celebrating top grades or participating in U Sing and intramurals, he was always proud to call himself a Lambda Chi Al- pha. "We had a group of talented men in the Chapter House, and I was provided with great examples and mentors to challenge myself." Brandon remembers understanding what hard work and the success that follows suit looks like from in- teracting with his Gamma-Rho Zeta brothers. His as- pirations to attend medical school were all the more attainable by him staying true to these values. He at- tended the University of Oklahoma's medical school with his roommate from the Chapter House. "To me, it was important to see this type of dedication on a daily basis. I was willing to put in the extra time to achieve my goals because of the examples my brothers set." He advises undergraduate members in a similar fash- ion. Obtaining goals is purely hard work. "What you do every day is what determines your success. Putting in that extra hour two can make all the difference be- cause without it, you would not be challenging your- self to become the best." For Brandon, the influence of Lambda Chi Alpha did not stop when he became an alumnus. Instead, his con- nection to his brothers has only become stronger as he remains in touch with many friends from his home- town and other professionals in the Oklahoma City area. "This connection of being a Lambda Chi even extends beyond the local level. When I first met my brother-in-law, we had the instantaneous connection from the fraternity. Even though we pledged at differ- ent chapters, the bond is still there." Brandon is a fellowship-trained hip preservation spe- cialist in Oklahoma City, Okla., where his roommate from sophomore year is also his surgical partner. He can be reached at mbdonjohn@gmail.com. Gold Level ($1,500 and above) Truman C. Edminster, ΓΡ 855 Rajendra Patel, ΓΡ 1120 Craig A. Purser, ΓΡ 1268 Green Level ($500 to $1,499) Purple Level (Up to $499) Jack B. Austerman, ΓΡ 212 Dr. F. Kent Kyger, ΓΡ 339 John L. Wooley, ΓΡ 407 John T. Van Loon, ΓΡ 410 William F. Frensley, ΓΡ 492 Ronald L. Sheffield, ΓΡ 515 Charles M. Evans, ΓΡ 532 Jack P. Gatewood, ΓΡ 560 Jackson D. Scott, ΓΡ 680 Douglas C. Hellerson, ΓΡ 718 Robert S. Stewart, ΓΡ 816 Thomas L. Vogt, ΓΡ 964 Greg A. Vlahos, ΓΡ 972 Todd R. Schlosser, ΓΡ 1168 Stephen D. Confer, ΓΡ 1665 Beau R. Brumfield, ΓΡ 1909 Kyle R. Bertholf, ΓΡ 2018 I n fall 2017, 20 generous alumni responded to our call for support and donated more than $33,735 to Gamma-Rho Zeta. These funds were used to provide scholarships and leadership opportunities, contribute to our capital campaign efforts, strengthen our alumni relations pro- gram, and create our memorial walkway. 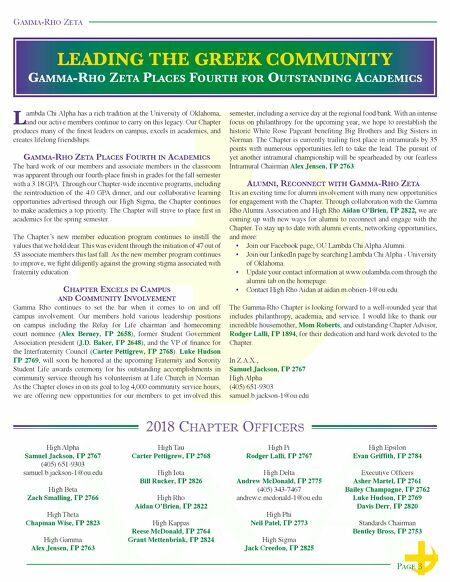 Supporting these opportunities helps us continue Gamma-Rho Zeta's legacy at the University of Oklahoma. Donors are listed in their cumulative giving level. 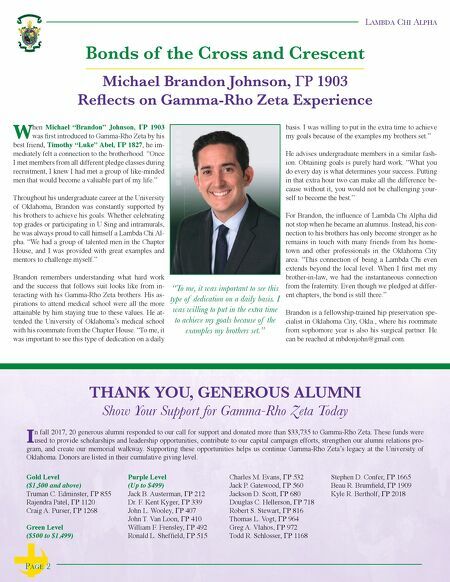 THANK YOU, GENEROUS ALUMNI Show Your Support for Gamma-Rho Zeta Today Bonds of the Cross and Crescent Michael Brandon Johnson, ΓΡ 1903 Reflects on Gamma-Rho Zeta Experience "To me, it was important to see this type of dedication on a daily basis. I was willing to put in the extra time to achieve my goals because of the examples my brothers set."